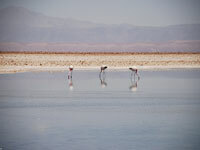 San Pedro de Atacama is not famous for its sightseeing opportunities but rather because it is situated in the midst of an adventurer's paradise of deserts, mountains, lagoons and salt pans. Travellers usually use the village as a home base while exploring the astounding landscapes to be found close by, without feeling the need to spend much time in the little town itself. Which is not to say the town is not worthy of mention; it just pales in comparison to its surroundings. Sandboarding, hiking, horse riding and mountain biking are all commonly enjoyed activities in the area. And once you are stiff and exhausted from all your thrilling outdoor escapades there is nothing better than visiting the Puritama Hot Springs to soak it all away in the naturally hot water, or sitting in one of the shady alcoves of a bar on the main plaza with an ice-cold cocktail in hand. One attraction in San Pedro de Atacama which must be visited is Pukara de Quitor. These ancient, pre-Incan ruins are less than an hour's walk from the centre of town and, although the fortifications are not as impressive in scale as some of the mammoth ruins of South America, the views from the site are spectacular. 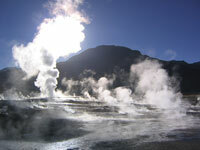 Also close to the town are the El Tatio Geysers and the opportunity to experience this unique, steamy environment should not be missed. In addition, there are a number of lagoons high up on the plateau which delight visitors. The Reserva Nacional Los Flamencos is said by some to be the most popular nature reserve in Chile, which is really saying something in a country which boasts so many truly breath-taking wilderness areas. The Valley of the Moon, a surreal salt lake landscape, is one of the most popular destinations within the park and can actually be reached comfortably by bike from San Pedro for those who would prefer to avoid the crowded tours. It is a huge reserve with many areas worth exploring for the beautiful desert scenery and interesting flora and fauna.